Imagine that you're a point on a line. The line stretches infinitely far in front of you, and infinitely far behind you. One day you get bored of hanging out where you are, and decide to see what the points up ahead are like. 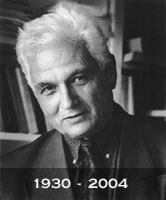 It's with a heavy heart that I note the passing of Jacques Derrida. He was a gifted philosopher and linguist, and many of the central tenets of his work have made their way into my own view of the world. For the past several hours, I've been attempting to qualify and quantify the effects that his writing has had on my life, and I find myself unable to unravel the skein of cause and effect far enough to determine precisely what, in me, is of his creation. Such is the mark of a great idea, that in its communication, those who understand it feel as if they knew it all along somewhere beneath the surface of their mind. Mssr. Derrida would probably argue against that statement, but, at least when I read it, I know it to be true. Bon voyage, monsieur. I thank you. N.B. : This is one of those posts that has a little something offensive for just about everybody. Have fun. Tonight, with thoughts of Easter and a war going on in a Muslim nation floating around in my head, I had (if you'll pardon the pun) a revelation of sorts. Before I get to that though, we're going to need to spend a minute doing a rough theological genealogy. Pretty much everybody in the english speaking world (my current audience), and quite a few others I might point out, understand that Christianity is descended directly from Judaism. Jesus was Jewish and, according to Christian mythos, was the messiah that had been prophesied somewhere in the Torah (roughly, the Old Testament to those of you who didn't know). There's a pretty easy line that can be drawn between the people that believe in Jesus as the son of God (a.k.a. Christians) and those that believe that Jesus was a heck of a nice guy, but wasn't in and of himself a deity (a.k.a. Jews).